Hailed as an "Instant landmark," Frank Gehry's Bilbao Guggenheim brought a new sense of relevance to architecture in the transformation of urban landscapes. Gehry's optimistic artichoke amid Bilbao's postindustrial ruin has become an icon of what architecture can do for a city decline. As a result, every city has dreamed of its own Guggenheim effect. 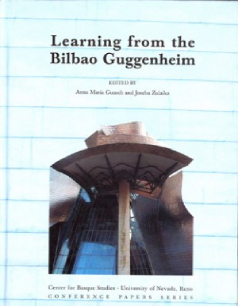 This volume gathers, artists, architecture critics, urban planners, art historians, and others to discuss the various aspects of the Bilbao Guggenheim.